During test case: "Test Port Recognition - Case ID: hiu-002" on my HP-G62 laptop, when I attach a usb based music player to a usb port, banshee music player does not open, but nautilus opens instead. All the files in the music player are displayed in natilus, if I click on a music file, banshee then opens. There is no the Actions music player in your lsusb.txt. Please plug your music player into usb port and run 'lsusb -v', then post the result to lauchpad. I see your problem now. you can see files in shell or file manager. And it is not a problem inside "linux" package. But I'm sure that with natty, when this music player is plugged in, a window opens asking me with what I want to open the device, and banshee media player is proposed. This does not happen with Oneiric alpha 3, only nautilus opens immediately. I have the same problem with Oneiric Beta 1, with Natty when this music player was connected a window opened asking with what to open the device, now instead nautilus opens and to start banshee you have to double click on a music file. Testcase: http://testcases.qa.ubuntu.com/Hardware/ExpansionPorts/USB on Test Port Recognition - Case ID: hiu-002 says "Verify that the files it contains are displayed within Banshee". With all the updates done I still have the same problem. when I attach a usb based music player to a usb port, banshee music player does not open, but nautilus opens instead. I am sure that with Natty when this music player was connected a window opened asking with what to open the device, now instead nautilus opens and to start banshee you have to double click on a music file. Testing Oneiric with all updates I'm still having the same problems. This did work in Maverick and Natty. For some reason the detection was dropped but the laptop testing question still expects a music player to be detected as such. If it is decided that it is no longer desirable or feasible to detect a media player specifically we can redo the test question so it will not fail. Windows does recognize media players as such, not that that has anything to do with our standards. I'm not sure why anyone thinks this is a kernel bug. The kernel is basically just responsible for providing setting up and providing interfaces for user software for reading and writing to the device. The fact that you can play your music in Banshee means that the kernel sets up your device just fine. Thus, this is not a "linux (Ubuntu)" bug. It's a bug (or maybe just misconfiguration) for nautilus media handling. Unity has screwed with all kinds of things, so it's hard to find the right way to configure this (I think they intend not to autostart anything from USB for safety reasons). I think on 11.10, you can find a "Removable Devices" configuration page under the System Settings (or type "Removable Devices" into the Dash search bar). Be sure to uncheck: "Never prompt or start programs on media insertion" and then choose Banshee under "Music player". Under the "Media" tab, see if the options for "Music Player" are helpful. For your case, you would want choose "Open Banshee Media Player." BTW, just because a problem exists when running the upstream kernel doesn't mean that it's a problem with the upstream kernel. Marking this bug Incomplete until the reporter tries the suggested configuration methods. I will try what is written in #41 as soon as I get home and let you know. I went to system settings, removable media and the ""Never prompt or start programs on media insertion" was already unchecked, under music player I selected "banshee" there was "ask what to do", but everything is still the same: upon inserting the usb media player nautilus opens, showing it's content as it was a usb key, i I click on a mp3 file on the usb media player then banshee opens. I could not find nautilus-file-management-properties on my system but searching in software centre I found "Nautilus-Actions configuration tools" but when I tried to launch it nothing happens, I launched it in terminal window a get this output: "Rilevato trace/breakpoint" (Rilevato means detected, I've got Italian language installed). Hmm, have you tried other types of media that should be affected by the options under the "Removable Media" configuration? For instance, a digital camera? 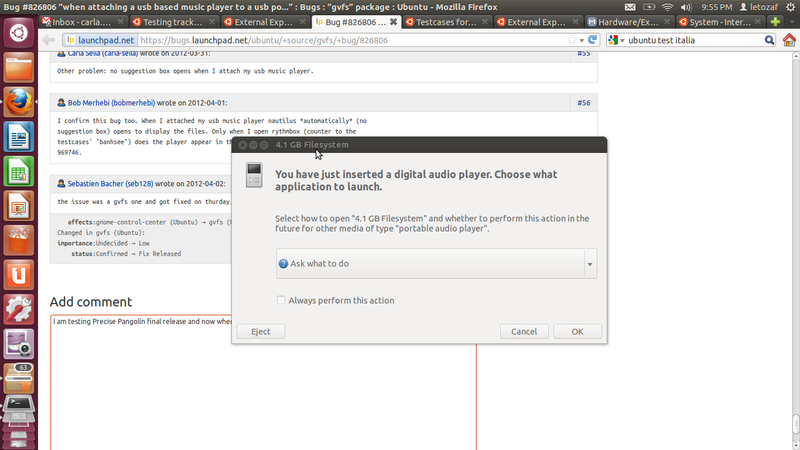 Or a different media player? Audio CDs? And what sort of icon shows up in the sidebar? Just a USB key icon? Or something else? GNOME may not be detecting your player as a media player anymore - just as a removable drive. Or maybe the whole automount system has a bug. Narrowing this down is important for your bug report to have any chance of finding its way to the right developer, let alone being fixed. Right now, it's just a generic "Ubuntu" bug. As for the icon, I'm attaching an image of the icon that shows up, to me it seems the correct one. Under "Removable Media", configuration I tried to put banshee on Audio DVD, music player, software and Audio CD but nothing changes, the window you see in the attached image "IconDisplayed" (nautilus). I do not have other choices related to audio or music to put banshee as a choice. So your player is still detected properly in Oneiric, but GNOME does not launch any software at mount time. This is an issue. I was not interested only in Removable Media choices that involve Banshee; I wanted to see if other devices follow the options you specify in Removable Media. If so, then this is a fairly general system bug (although this bug doesn't appear on my system with my devices). If not, then it's somehow tied to the properties of your device. So can you see if anything appears (displaying software options or opening photo software automatically, for example) for other devices when they are plugged in? I inserted an audio CD and banshee opened correctly, I attached my camera and shotwell opened correctly and I inserted a video DVD and Totem opened correctly. 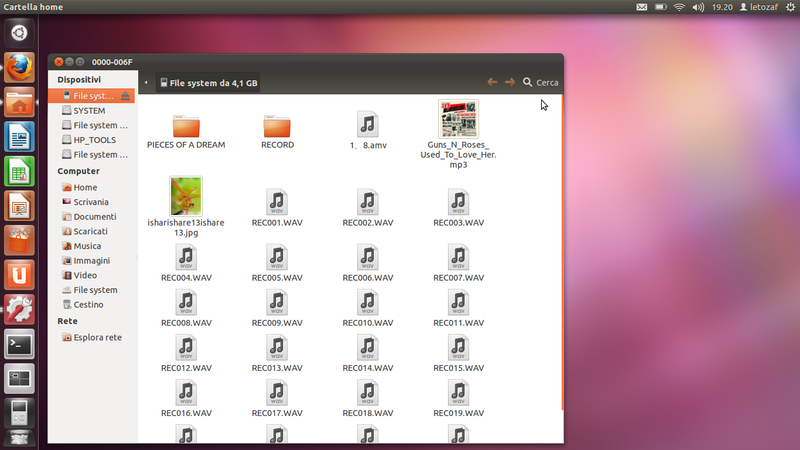 I tried again with my usb player, but nautilus opens. When I plug in my Android phone, there is a selection what to do: a) open in Nautilus b) open in Shotwell - but anything regarding to Banshee or music is missing. When I start Banshee manually, it recognizes the phone as Music Player device. During the test of my laptop on Precise Pangolin Beta 2 I'm having the same problem. When I attach a music player to my laptop rythmbox does not open, nautilus opens instead. Other problem: no suggestion box opens when I attach my usb music player. I confirm this bug too. 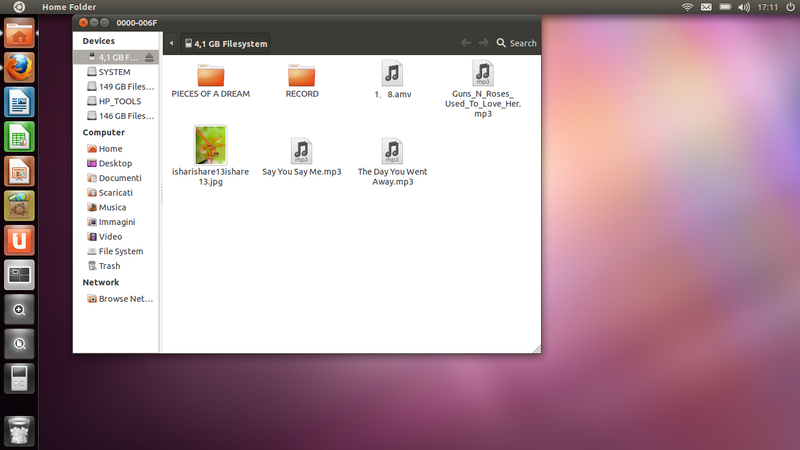 When I attached my usb music player nautilus *automatically* (no suggestion box) opens to display the files. Only when I open rythmbox (counter to the testcases' "banhsee") does the player appear in the devices. Another related bug is: 969746. I am testing Precise Pangolin final release and now when I insert my usb music player a suggestion box opens and it askes me what to do, from the drop down box I can select rythmbox and everything is ok now. The only little difference with the test case is that when the suggestion box opens instead of suggesting banshee/rythmobox, it asks me what to do, but I do not think this is realy a bug. I'm attaching a screenshot of the suggestion box. On Quantal alpha 2 nothing happens when you attach a USB music player, you have to open nautilus and on the left side click on the device for mounting it, after mounting it you can see all it's contents. As the problem occured also with a USK key, I rebooted my laptop, and after that, when attaching the USB music player I did not get a suggestion box but only nautilus opened showing it's contents. So I think it's a regresion. I will open a new report.